I’m always on the prowl for tasty veggie sides that aren’t frozen or canned. I refuse to buy anything but canned corn – and frozen veggies are okay – but fresh is best. We love asparagus and brussels sprouts but they’re seasonal and sometimes VERY expensive. One thing that seems to be available year around, and is quite inexpensive, is cabbage. Aside from coleslaw, I never really gave it much thought as a side dish – and then I saw oven roasted cabbage on Youtube and I had to try it myself. Roasting the cabbage brings out the same things we love about roasted brussels sprouts – that slightly charred flavor. You can put any type of spice blend you like on it – maybe a splash of soy if you’re doing Asian – or some oregano if you’re doing Greek or Italian. It’s really flexible and up to you. I also like that for the 3 of us at home, 1 head of cabbage will do 2 meals, at least. It keeps well and the leftovers can be reheated or thrown in a soup or stir fry. Give it a try and let me know what variations you like! 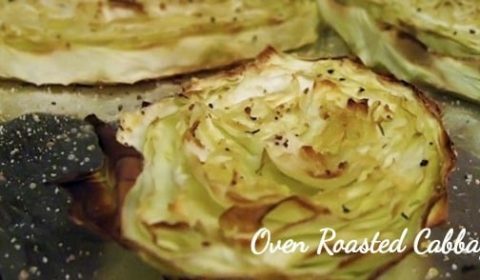 Cut cabbage in half and slice 1/2 of it into 1/2" to 3/4" "steaks"
Roast in oven for approx. 25 minutes until the cabbage turns golden brown and delicious - how brown you want it is up to you.